Sandy Vine's long-time experience in leading this tight and terrific dance band also helps to make the event a great success. He judges the mood of a dance crowd like a seasoned professional should - just the right mixture of classic party fast tunes as well as those romantic slow songs to which all couples love to sway. The volume of the group is perfect - soft enough to enjoy a conversation at the table, but just intense enough to create energy on the dance floor. And asking for song requests is never a problem. The band will gladly play any song request that they know as a group. Sandy Vine and the Midnights have an extensive repertoire with enough variety to keep any crowd up on the dance floor. Do you have backup equipment? What happens if one of your musicians gets sick? We have access to a backup audio system if for some reason something were to go wrong. Rest assured that we do maintain our quality equipment and in 25 years of performing have never had a system go down. Our band carries the same tight group of musicians to all functions. However musicians are human and can become ill, or have rare unavoidable matters come up that may prohibit them from performing. 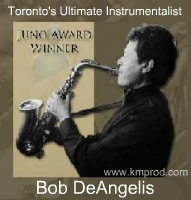 We have access to the best musicians in our area and if necessary will replace a sick musician with another experienced performer who will do an excellent job and fit in seamlessly. In all the years of performing I have never cancelled due to my own sickness. I once had to hire a replacement vocalist (at my own cost) due to the severe laryngitis I contracted, but I still performed the evening on keyboards and led the band as normal. Yes we do. Most reception venues insist on it from the outside vendors. Do you take requests? Can you customize your song list for the guests attending our function? Of course - in fact, we encourage requests! There is nothing more satisfying to us than being able to belt out a request that fills the dance floor. If we don't know a particular request, then we'll at least try to perform something along the same style or from the same artist. Part of our success comes from having a wide variety of music and the ability to read an audience in order to perform the right songs for the guests attending. Furthermore, we can also customize an evening of themed music if your corporate event has a particular theme or music era associated with it. Please inquire on the various music themes we can support. How long do you play? How many breaks do you take? Usually, clients will book a four hour block of time for the dance portion of an evening (e.g. 9pm-1am, 8pm-12am). We prefer to do longer sets to get everyone pumped on the dance floor, and they typically last between 90 -120 minutes in a NON STOP format. "NON STOP" music means that we perform songs seamlessly - one into another so that the dance floor is always moving. No awkward pauses - no idle chatter - just lots of dance music! One or two (max.) breaks are the norm for the dance portion. The scheduling of your evening will dictate when a break is taken. We can provide recorded music for all breaks. You are not limited to a four hour block by any means. Music is available through dinner and the cocktail hour if needed. If preferred, the entire band can be hired to perform music for dancing through the dinner hour. 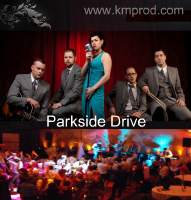 We can customize an evening of music based on your specific requirements. Some events like weddings and fundraising galas require us to dress formally. Others may assume a more business-casual approach (e.g. dress shirt and slacks). Yet other more casual events may prefer us in jeans and loud Hawaiian shirts. Be ASSURED that the band will be dressed appropriately for your event. We will confirm all of these details when you book an event with us. What is the next step if we are interested? 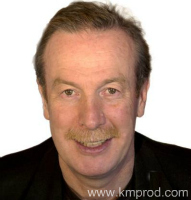 Sandy Vine and The Midnights are represented by K&M Productions. 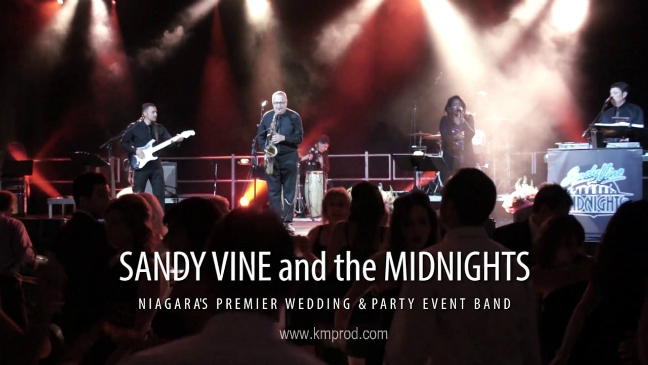 For more information, fees & booking party/dance band Sandy Vine & The Midnights, contact us. This is our fifth year in a row we have hired Sandy Vine and The Midnights to entertain for our annual Christmas dance. It is a pleasure to work with them. I have used Sandy Vine's musical services over the years for almost every type of event imaginable - corporate events, dances, winery functions and festival events. I highly recommend hiring him for any event. Your music was marvelous and fit the occasion perfectly. I have thoroughly enjoyed working with you and your talented musicians. You are very dependable, courteous and pleasant to be around. I look forward to working with you in the future. Sandy, you did a fantastic job on Tuesday night. The typical comment I got back afterwards was that everyone wished the evening was longer. I wouldn't be surprised if you get several of those in attendance calling for bookings. I'd be pleased to be used as a reference anytime you want. I look forward to the opportunity of working with you again.